SanLing Chan has been practising law for over 30 years. Obtaining her Bachelor of Jurisprudence (1983) and Bachelor of Laws (1984) from the University of Western Australia, she has gone on to practise at the Supreme Court of Western Australia (1986), Federal Court of Australia (1997), and High Court of Australia (1997). In addition to her extensive legal skills, SanLing’s experience in migration services sets her apart as an immigration agent you can count on. 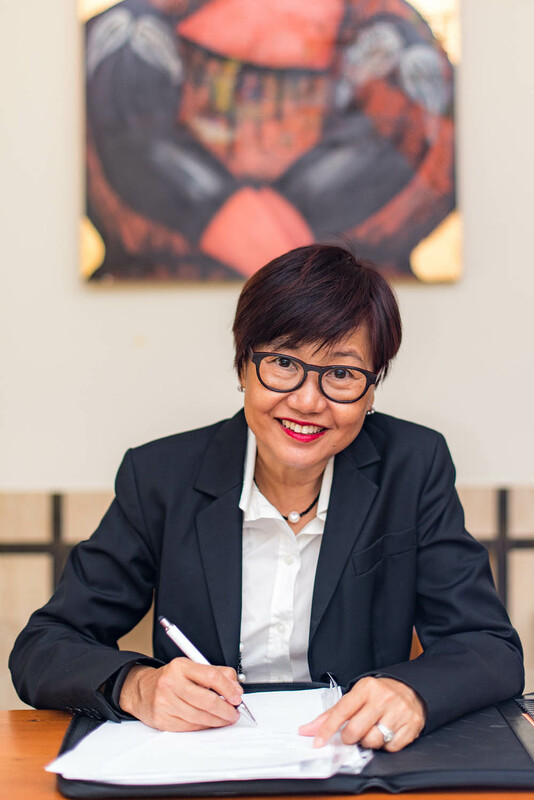 As a registered Migration Agent with the MARA since 1997, SanLing combines her legal experience and migration expertise to provide you with the peace of mind you need when selecting an immigration specialist. From 1996 to 2004, SanLing worked for Australian Visa and Migration Services (AVMS), one of the largest and leading firms of migration agents in Western Australia. In recent years, SanLing has been working as a sole practitioner, but she maintains regular and important links with key professionals in her field of expertise. Furthermore, SanLing has continued to stay abreast of current trends and issues in Australian immigration law through her attendance, as well as delivery of lectures and presentations, at professional development programmes. As a legal practitioner well versed with the Migration Act 1958 and Migration Regulations 1994, Department of Immigration and Border Protection (DIBP) Advice Manual and Migration Series Instructions, SanLing has advised potential applicants on visa issues, lodged countless successful applications, and persuaded the DIBP against the cancellation of visas at times. In August 2017, SanLing was presented with a Certificate of Appreciation from Law Access (a not-for-profit organisation that coordinates the giving of pro bono legal assistance by the Western Australian legal profession) for her pro bono contribution and her work to promote equal access to justice in Western Australia. Away from her professional “day job” as an Immigration Solicitor, SanLing Chan is passionately engaged in seeking to improve the lives and welfare of those who are in less fortunate circumstances. In April 2010, SanLing and her daughter undertook an expedition to Nepal, to visit the SARA Children’s Home that she has been supporting. She was able to meet first hand with Pastor Tej Rokka, the Nepalese young man whose desire and vision is to create a loving and caring environment for some of the many abandoned and orphaned children in Nepal. While in Kathmandu, SanLing saw first hand the challenges and difficulties of raising funds to complete the construction of a new building for SARA. Faced with a genuine need, SanLing made a commitment to help Pastor Rokka raise the remaining funds required to finish this important project. On the other side of Kathmandu is the current rented property that SARA uses to house the 30 or so abandoned children and orphans. Here’s a photo of some of the children living at SARA. Will you consider helping to support the work and children at SARA? If so, please e-mail SanLing today. While in Nepal, SanLing and her daughter also spent 5 days trekking on a part of the Annapurna Circuit, visiting Birethangi, Ghandruk and Ghorepani along the way. They also took an Agni Air scenic flight over the Himalayas and saw Mount Everest with their own eyes! While the landscape is very spectacular and beautiful, the weather and terrain can be extremely hostile. Sadly, on 24th August 2010, 14 tourists and crew perished on a similar scenic flight operated by the same company. Pastor Tej Rokka, Kathmandu, Nepal. You might have heard, watched and read news regarding massive flood in Nepal during this week through Social Media, TV, newspapers. It is true and it is happening although Nepal. If you haven’t yet got the chance to read and hear this tragic news, please try to find out and kindly pray for this situation. We are helpless here in the midst of huge mess and cry of people who are indeed in urgent need of rescue, relief help and rehabilitation. But my heart is so heavy, burden and eyes are full of tears and hands are ready to open with little things to address this situation. I talked to my Church people, leaders and ministers here locally and we are ready to give away our five loaves and two fishes towards flood, landslide victims. As there are hundreds of thousands of people in need and we are praying and trusting God to multiply our resources we have. We are humbly requesting you as our urgent appeal to consider prayerfully this need. Situation:- This time there is heavy rain all over Nepal. It has affected all people, all regions and all things. Believers, their families, children, church places, other people, families, children, schools, etc are badly flooded, damaged and so far over 100 people died, hundreds are missing in the flood and landslide and thousands of homes destroyed, even the airport is flooded and roads are blocked. It is terrible natural disaster. Several churches are flooded and cannot be use anymore. People need blankets, tents, foods, Medicines, etc. We as God’s children, minister of the Gospel, Christian Church and Ministries would like to request you, you Church, group, Organization and company to pray and partner with us to address this disaster as urgent relief help. SARA Ministries Nepal Team, SARA Children’s Home, SARA Missionary Church Council Nepal, New Missionary Bible School Students to be protected, Rescue, and may receive relief help immediately. We need clothes for Children, old people and blankets, tents, foods and first aid medicines right a way so God may bring financial breakthrough. We can buy all of these items here in the country. We have some funds here locally and we need more funds. There is no exact amount because needs are great. For now we need at least NRS.50,00000 abut US$50,000 to provide immediate help to victims like clothes, foods, blankets, tents etc. Then later we will help people rebuild their houses after rain and flood stops. Pray for Pastor Tej Rokka and his team of Pastors, disciples and prayer warriors who are leading this relief help to take those victimized areas.